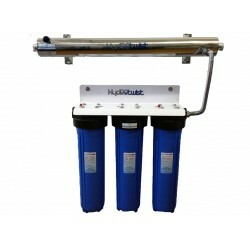 UV Quad Whole House Water Filter System CTO 30LPM Big Blue 10"
Hand Built & Factory Tested, Neat and Compact, This Quality Quad Stage Whole House Point of Entry UV Water Filtration System can be convieniently installed on the supply line of your house or property will supply up to 30 litres per minute Easy for a Handyman to install. 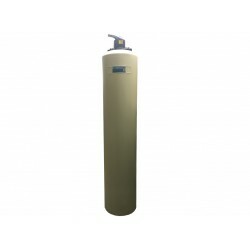 Kit Includes: Mount..
UV Quad Whole House Water Filter System CTO 48LPM Big Blue 20"
Hand Built & Factory Tested, Neat and Compact, This Quality Quad Stage Whole House Point of Entry UV Water Filtration System can be convieniently installed on the supply line of your house or property. Easy for Handyman to install. Will supply up to 48 litres per minute. 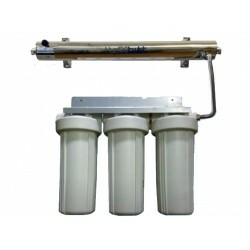 Kit Includes: Mounting B..
UV Quad Whole House Water Filter System CTO 91LPM Big Blue 20"
Hand Built & Factory Tested, Neat and Compact, This Quality Quad Stage Whole House Point of Entry UV Water Filtration System can be convieniently installed on the supply line of your house or property. Easy for Handyman to install. Will supply up to 91 litres per minute. 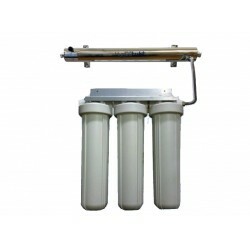 Kit Includes: Mounting B..
UV Quad Whole House Water Filter System USA 30LPM Big White 10"
Hand Built & Factory Tested, Neat and Compact, This Quality Quad Stage USA Premium Whole House Point of Entry UV Water Filtration System can be convieniently installed on the supply line of your house or property. Will supply up to 30 litres per minute Easy for a Handyman to install. Kit In..
UV Quad Whole House Water Filter System USA 48LPM Big White 20"
Hand Built & Factory Tested, Neat and Compact, This Premium USA Quad Stage Whole House Point of Entry UV Water Filtration System can be convieniently installed on the supply line of your house or property. Easy for Handyman to install. 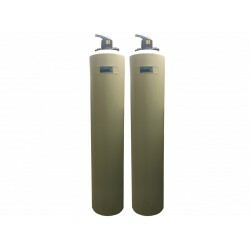 Will supply up to 48 litres per minute Kit Includes: Mountin..
UV Quad Whole House Water Filter System USA 91LPM Big White 20"
Hand Built & Factory Tested, Neat and Compact, This Premium USA Quad Stage Whole House Point of Entry UV Water Filtration System can be convieniently installed on the supply line of your house or property. Easy for Handyman to install. Will supply up to 91 litres per minute. 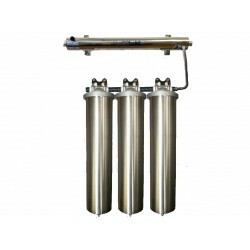 Kit Includes: Mounti..
Hand Built & Factory Tested, Neat and Compact, This Premium Quad Stage Premium Whole House Stainless Steel Point of Entry UV Water Filtration System can be convieniently installed on the supply line of your house or property. Will supply up to 30 litres per minute Easy for a Handyman to install..
Hand Built & Factory Tested, Neat and Compact, This Premium Quad Stage Whole House Point of Entry UV Water Filtration System can be convieniently installed on the supply line of your house or property. Easy for Handyman to install. Will supply up to 48 litres per minute Kit Includes: Stainless S..
Hand Built & Factory Tested, Neat and Compact, This Premium Quad Stage Whole House Point of Entry UV Water Filtration System can be convieniently installed on the supply line of your house or property. Easy for Handyman to install. 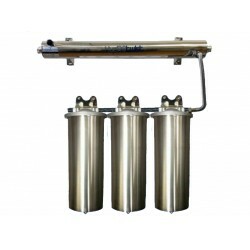 Will supply up to 91 litres per minute Kit Includes: Stainless S.. 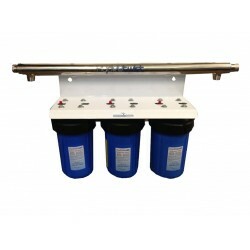 Premium whole house high flow GAC vessel system with high flow UV steriliser. Available in Manual back flush. Installed on mains plumbing, sediment and chlorine are removed from all taps and showers throughout the house, at 60 to 90 litres per minute, protecting tap washers, hot water systems and ap.. Premium whole house high flow GAC with scale reduction phosphate vessel system with high flow UV steriliser. Available in Manual back flush. Installed on mains plumbing, sediment and chlorine are removed from all taps and showers throughout the house, at up to 90 litres per minute, protecting tap wa.. Premium whole house high flow GAC with Fluoride reduction meida vessel system with high flow UV steriliser. Available in Manual back flush. Installed on mains plumbing, sediment and chlorine are removed from all taps and showers throughout the house, at up to 90 litres per minute, protecting tap was..